Writing is a process that is both intimate and solitary. Receiving any kind of feedback can be extremely stressful. It doesn't matter the size of the project you've written, receiving any negative comments can feel painful and cut right through to your core. In the long term both good and bad comments are a process all writer's need to go through in order to become writers. Dealing with that criticism is what I want to touch on today. Don't look at negative reactions as a reflection on you, see it as an opportunity to make your writing better. It's not easy articulating your thoughts in such a way that it will help other writer's. Any kind of criticism hurts, but its up to you to decide whether or not its relevant to the work you're doing. All natural responses are okay, this includes anger, frustration and guilt. Don't let any of those emotions guide your response. Instead take a deep breath, collect your thoughts. Have a walk, call family or friends, anything that can distract you in that moment. This will help you give a measured response. Don't take your feedback to heart because people are people at the end of the day, and everyone makes mistakes. The more time you spend writing, the better you'll become. You'll slowly realise that your editing, proofreading and writing skills are improving as you go on. After you've cooled down, go through the points that have been made against your writing. Ask yourself, are you being to clumsy with your topic? Is there a problem with your story, prose or characters? Is your writing haphazard? At first glance it may look like everything is okay, but when you start to digging the problem's may slowly begin to show, and require changes to be made. 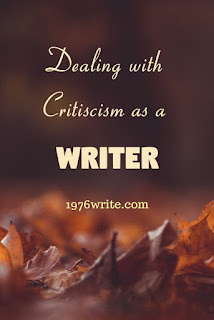 Your writing isn't an extension of you, so when criticism is thrown in your direction it should never be taken personally. Give yourself and your work some distance, in order to assess any criticism that comes your way. If you invest all of your time and energy into one blog post/article at a time, and don't like the result, you always have another one to work on even when one is a nonstarter. In other words, don't put your eggs in one basket. If you want to be a great writer, you need to have confidence to put your thoughts into action. Once you understand the feedback, reply to the comments that have been made. Send an email if its freelancing work you may have done, or talk it over on the phone. Great advice, especially about changing your mind set and view criticism as a way to improve your work.